I was trying to make a quick card before we traveled to Charleston with my mother. I wasn't going to have a lot of time when we returned to get her card done. In reality, I completed the background before we left but didn't finish this one off until we got back. I'll admit it isn't my favorite card. I love the background. 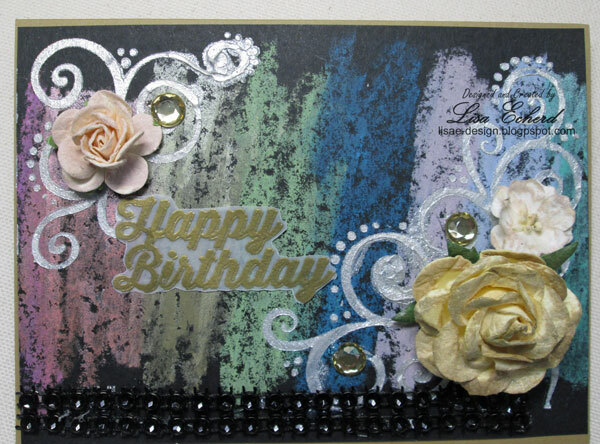 The gelatos really show off on this black cardstock. I think the flowers would have been better if I'd given them a coat of the iridescent medium before adding color. Mulberry flowers are very absorbent so a coat of any type of gel based medium before adding color works best and really has a pretty effect. Mother did love the card and that is all that matters. Check out my Etsy shop for mixed media supplies including flowers and trim at Lovely Layers Art. That is so so pretty Lisa! I bet your mum loves it! How is she doing since the loss of your dad? And how about you? I lost my mum just on a month ago now and I don't think it's really hit me yet. I'm thankful that I was there with her on her last birthday. She hasn't been well for about 18 months so I've been able to spend a lot of time with her which was lovely. I miss her though. I'm so sorry for your loss. Grief can come in waves. Be patient with yourself and your feelings. Thank you for asking after us. We are doing well. We just took Mother on a trip which was good for us all to get away for a few days. She is an avid gardener and has been working outside when the weather permits. Spring is coming late this year. Again, I'm sorry for your loss. I know it isn't easy.